Cancer, like any other illness, needs the right environment to grow and flourish. Depriving cancer of its food and the energy and environment for growth may not only prevent cancer, it can keep it from progressing. 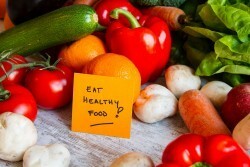 Along with traditional methods, good nutrition will allow your body to stop cancer in its tracks. If you have cancer and nutrition is good, you have a good chance of beating it. If you don’t have cancer and nutrition is poor, whether or not you have risk factors, you set the stage for its development. Sugar – cancer feeds on sugar and is a huge factor in its development and progression. Sugar binds to protein, causes oxidation and oxidation accelerates inflammation. Limiting your sugar intake will decrease the risk and progression of cancer and nutrition plays a strong role in prevention and recovery. Sugar is devoid of nutritional value and provides only empty calories that increase weight. Being overweight also increases cancer risk so it’s adding insult to injury. Saturated fat – animal products such as meat and dairy contain a lot of saturated fats that are inflammatory. The China Study illustrated that those who ate a plant based diet were less likely to develop cancer than those who ate a lot of animal products. Instead of meat being your main course and vegetables being a side dish, doing the reverse and increasing your vegetable intake and decreasing your meat and dairy portions will go a long way to better overall health. Alcohol has been shown to increase the risk of head, neck, liver, esophageal, breast, colon, rectal and stomach cancer. Alcohol can increase weight gain, which increases cancer risk. Its breakdown products, ethanol, and acetyladledhyde can damage DNA, and it can affect the breakdown of hormones such as estrogen. Men should limit their intake to 2 or less drinks a day and women to 1 or less drinks a day depending on overall health and other risk factors. Over 200 studies evaluated the relationship between cancer and nutrition and fruits and vegetables came out on top for decreasing the risk. There is overwhelming evidence of their protective effects. Here are the powerhouse foods to fight or prevent cancer and nutrition to help you heal. Cruciferous vegetables such as bok choy, broccoli, Brussels sprouts, cabbage, cauliflower, collard greens, horseradish, kale, and radishes are powerful detoxifiers. They also contain substances that have anti cancer properties. Estrogen and hormones can be metabolized into toxic by products that cause cancer and nutrition can detoxify carcinogens. Cruciferous vegetables have I3C (indole 3 carbinol) and DIM (diindolylmethane) that metabolize estrogen from a potentially toxic to a more benign by product. Some people avoid cruciferous vegetables because they may affect the thyroid gland, however cooking them and eating them with food that contains iodine negates these effects. Alliums such as onions, garlic, leeks, chives, scallions and shallots are also potent detoxifiers. They can induce the liver to form glutathione, the master antioxidant that has anti cancer properties. Flavonols and organosulfur compounds found in these flavorful foods have been shown to have anti tumor properties. Add these to salads, vegetables, meats, soups, and stews to beat cancer and nutrition becomes a powerful weapon to fight it. Colorful carotenoids as well as lycopene and lutein, which are part of he carotenoid or Vitamin A family, have powerful antioxidant and anti cancer properties. They can be found in carrots, sweet potatoes, pink grapefruit, watermelon, tomatoes and apricots. Studies on Vitamin A supplements have been mixed, however the natural form of mixed carotenoids have been shown to decrease the risk of cancer. The isolated synthetic forms, which most multivitamins have, may increase the risk of lung cancer in smokers. Be sure to eat a wide variety of vegetables to get the full spectrum of carotenoids and if you take a multivitamin be sure it has mixed carotenoids. Cancer and nutrition go hand in hand. You can feed cancer or starve it thereby letting it die. Armed with knowledge, look at your diet and limit the cancer causing foods and substances and increase the cancer fighting ones so you don’t have to face a battle. Get advice from a functional medicine doctor on cancer and nutrition to decrease your risk so you can live younger and healthier. Schedule a consultation now.